Brown Bag has been trading online since 1999, getting customers access to the hottest names in men’s fashion at discounted prices. You can shop by browsing your favourite brands or the type of garments you’re looking for, and then refining by price and fit. With tees and shorts for the summer months, and jackets and hoodies and jeans for when you need to layer up, Brown Bag has your wardrobe covered for every season and style. If you’re in need of inspiration, check out the Brown Bag Blog, full of tips on the hottest new lines and trends for you to follow. Brown Bag understand how fast the internet moves, so it’s launched a fantastic price promise scheme. If you see the same item for less elsewhere after you’ve bought it from Brown Bag, you’ll be refunded the difference in credit. Whatever you're after, with an average score of over 93% on Feefo Reviews, customer satisfaction is at the heart of what Brown Bag does, so you'll be sure of a great shopping experience. How do I use my Brown Bag discount code? Brown Bag’s clearance section has some great deals - get 'em before they’re gone! Can I buy gift vouchers for Brown Bag? Yes, you can buy them in set denominations here. I’m a student, can I get a discount at Brown Bag? You sure can, verify your student status here to take advantage of the discount. How can I pay for Brown Bag orders? You can pay via Mastercard, Visa, Visa Debit/Delta, Maestro, Solo, Visa Electron, AmEx or Paypal. Must place order by 8pm weekdays or 2pm weekends to receive your order the next day. You have 14 days from receipt of your items to inform Brown Bag of your intention to return. You have a further 14 days to return. Refunds or exchanges can be accepted. You must post your items back to Brown Bag with your returns form included (will arrive with your parcel). Tick ‘Refund Request’. Looking for the hottest designer labels at bargain prices? Brown Bag has got you covered. With a great rolling stock of seasonal, designer outfits, you can get your fix of Armani, Lacoste, Superdry and more for less than you’d expect. A Brown Bag discount code could save you money off your next order, meaning fill can your wardrobe with even more sharp gear without breaking the bank. Looking good doesn’t have to be a hassle with Brown Bag. 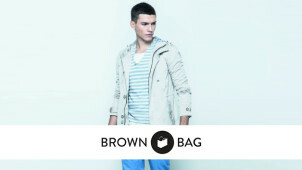 Brown Bag’s brand list is a who’s who of what’s hot in the men’s fashion world. All your favourites are here, from Armani Jeans and Nudie Jeans Co, to great footwear from Kickers and Skechers. Its got Marshall Artist’s rugged outerwear and Superdry’s sharp selection of tees. You might be an outdoor adventurer or a well dressed night owl: whatever your style, Brown Bag have great prices on a top brand to match. You’d be a right mug not to love a polo shirt, and Brown Bag has got polos coming out of its ears. With Lyle and Scott, Lacoste and many other top names, Brown Bag’s polo selection will leave you well stocked for the summer months and beyond. A Brown Bag promo code could save you money off your next order, so you can get yourself some top shirts for less.